THE INAUGURATION OF WINGS INDIA 2018 BY TELANGANA IT AND INDUSTRIES MINISTER K.T. RAMA RAO. R.N. CHOUBEY, SECRETARY, MOCA, USHA PADHEE, JOINT SECRETARY, MOCA, SANDIP SOMANY SR. VP, FICCI AND B.S. BHULLAR, DIRECTOR GENERAL, DGCA, ARE ALSO SEEN IN THE PICTURE. The biennial event, organised by FICCI jointly with MoCA and Airport Authority of India (AAI), will witness the global industry leaders discussing policy issues and business aspects of the civil aviation sector. 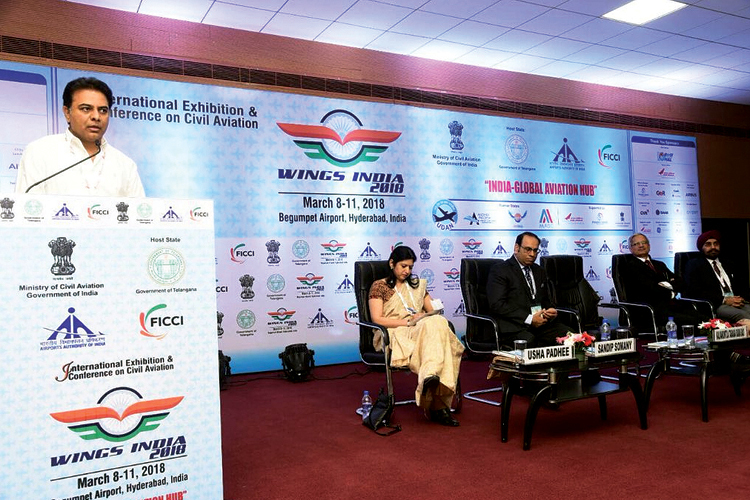 The theme of the four-day biennial event this year is ‘India-Global Aviation Hub’. Delivering his inaugural speech, Rama Rao complimented the former Civil Aviation Minister Ashok Gajapati Raju and his entire team at the Ministry of Civil Aviation for their exemplary work in expanding the reach of the aviation industry in the country. He congratulated them for implementation of the UDAN (Ude Desh ka Aam Naagrik)-Regional connectivity Scheme (RCS) which has brought the unserved and underserved areas under the ambit of civil aviation. 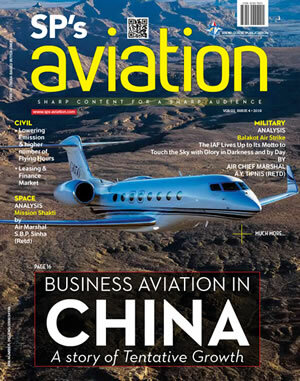 “They have done a stellar work... and I hope the civil aviation industry continues to grow,” he said. Gajapati Raju resigned from his post before commencement of the event. Talking about the growth of the aerospace industry in Telangana, the Minister said that it is the most vibrant hub of this industry in India and hosts large number of global firms in aerospace and aviation sector. He informed that the Warangal airport is being made functional under RCS. Talking about the leadership position of his state in the sector specific skill in the aviation and aerospace sector, he requested MoCA to open a regional centre of the National Aviation University in the state. Speaking further Rama Rao added that Telangana has the most competitive incentive offer for setting up aviation industry in the country and is establishing fourth aerospace park. At present, state has three aerospace park out of which two have been designated as the aerospace special economic zone. State government envisaged to make Telangana as skilled manpower provider to this industry, not only in India, but for the world. One of the major focus areas of the Wings India 2018 is UDAN-RCS, which was launched as part of the National Civil Aviation Policy 2016, which envisions enhancing regional connectivity through a market-based mechanism in which airlines bid for seat subsidies. This is first-of-its-kind scheme globally to create affordable yet economically viable and profitable flights on regional routes so that flying becomes affordable to the common man even in small towns. Speaking at the event, Rajiv Nayan Choubey, Secretary, MoCA, discussed how UDAN is changing the contours of the civil aviation industry in India and the new policy initiatives that will make the sector more vibrant. He anticipates India becoming the world’s biggest aviation market in coming years if the fuel prices remains low. At present country is witnessing around 20 per cent year on year growth in this sector, he said. Calling the subsidy being given under the RCS as a “significant political step”, Choubey said that oil prices needed to remain soft, below $80 a barrel for the sector to grow at a CAGR of 15 per cent for the next 20 years. RCS will help industry grow at 15 per cent for next two decades. “This will require doubling of airport capacity every five years.” Choubey said that the Government was committed to connecting the cities and towns to increase regional connectivity in the country. Talking further he said that the ministry wants to be ahead of the growth curve and the Expression of Interest for the disinvestment of the Air India and Pawan Hans will be sent out in next couple of weeks. Highlighting a major concern of the sector, he said that VAT on aviation turbine fuel (ATF) was among the highest in the world and if state government reduce it this will help in reducing the ticket prices and state will not lose much revenue also. Later addressing the press, Choubey informed that the state governments are very enthusiastic about the UDAN and they are holding discussion with the airlines for increasing air traffic in their states. Highlighting some of the key challenges in the sector, he discussed the need for better air navigation and traffic management and matching infrastructure with growth. Discussing the new developments in RCS scheme, the Secretary informed that the Government of Assam has proposed to give a support of 100 crore per year for three years for international flights originating from Assam. He did not see any need for central support if state government takes any such initiatives and said that UDAN is a template for such scheme. Talking on the airport expansion, he said that AAI, with capital expenditure plan of 18,000 crore for four years, is working on expansion of a dozen brown field airports and two green field airports, one each at Delhi and Mumbai. On the requirement of additional pilots due to massive expansion of fleets, he said that India would be requiring around eight to ten thousand pilots in next half decade and we are working on it vigorously. India has around 900 aircraft on order. Replying to a query on regulation for unmanned aerial vehicle (UAV), B.S. 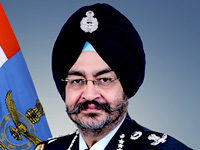 Bhullar, Director General, DGCA, during the press conference, said that hopefully in next couple of month government will be able to come out with it. Speaking on regulation for seaplanes, Bhullar said that for non-scheduled flights no regulation is required but for scheduled flights, government in next couple of months, will notify it. Talking to SP’s ShowNews on Indian Air Force’s support for UDAN, Secretary, on the side lines of press meet said that they are very supportive and there no issue between us. We understand each other’s need,” he said. 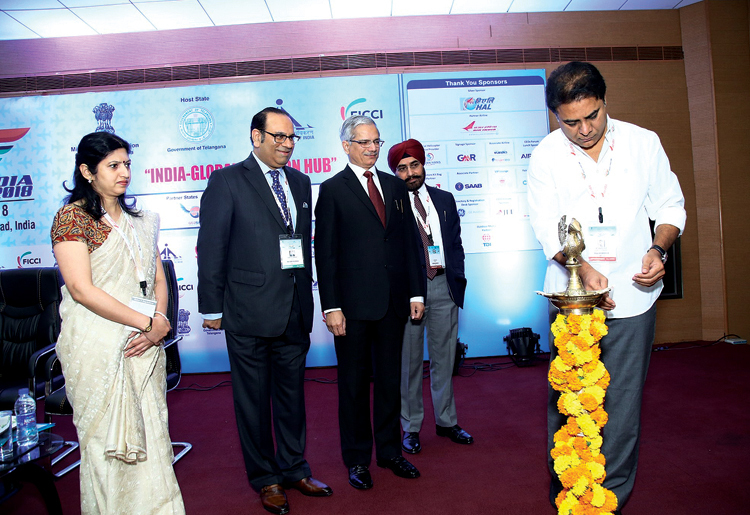 During the event, a White Paper and Exhibitors Directory were unveiled and two e-portals on air cargo were launched. The four-day event will witness the presence of 125 exhibitors and 35 CEOs. Wings India 2018 will also see representation from 10 countries, namely USA, Japan, UK, Russia, Singapore, France, Germany, Malaysia, Hong Kong, Italy and Iran. Besides, 15 aircraft by ATR, Honda, Trujet, Gulfstream, Boeing, Embraer, Dassault, Club one Air, Aeroteck, Zoom Air, Air India, NAL and others will be on static display. Besides the conference and exhibition, Roundtables on Tourism, Cargo and Logistics and Skills and G2B and B2B meetings are scheduled. More than 300 B2B meetings are scheduled during the course of the event.